The administration of San Diego State University issued a warning to the campus community Friday about a man who groped a student this week and remains at large. 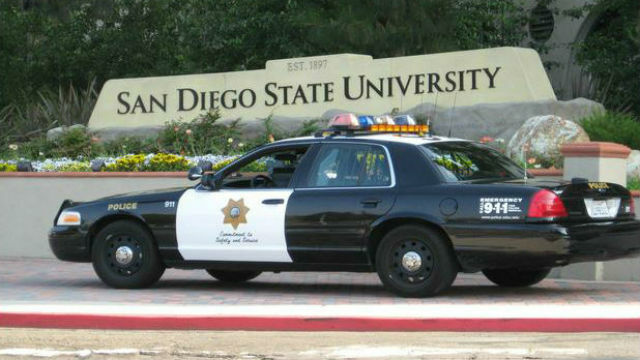 The victim was walking near the SDSU School of Music and Dance building when the unidentified assailant approached and complimented her on her looks about 8:45 p.m. Thursday, according to a campus public safety bulletin. He then tried to embrace the woman several times, prompting her to back away from him, after which he fondled her buttocks. As the victim hurried away, the man followed her to the Aztec Student Union offices before leaving the area in an unknown direction. The student described the perpetrator as black, about 40 years old and roughly 5 feet 7 inches tall, with an average build. He was wearing a brown flannel shirt and a yellow, red and green knit cap, she told police.